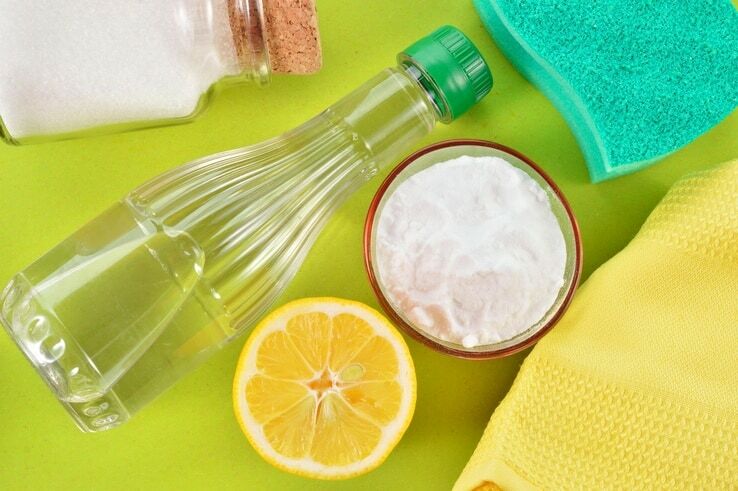 Home » How To Get The Urine Smell Out Of Clothes Once And For All! How To Get The Urine Smell Out Of Clothes Once And For All! As your children grown, they’ll have their share of accidents. Most of these accidents and messes can be cleaned up with relative ease and with no permanent smell left over on clothes. However, urine smells can persist, leaving lots of parents asking, how do you get the urine smell out of clothes? I wish it were as quick and easy as washing the clothes once and being done, but it’s not. But don’t lose hope! It isn’t too tricky, and it won’t take you too much longer than what you’ve already tried. In fact, I have found an easy way to get it done right the first time, so you’ll spend less time washing and sniffing, and more time enjoying those kids! The first ingredient that you will need will be regular old baking soda. This will neutralize the ammonia, which is acidic, left over from the urine since baking soda is a base. Just make sure that you don’t use any old containers that you have had opened in your fridge or cabinet for a while, as they will have a smell all on their own. Alternatively, you can use Borax if you do not have any baking soda handy. It will work in much the same manner to neutralize the urine odor that is still in the clothes. You will need a washing machine that you can control the water temperature to run two different cycles. If you don’t have a washer that you can do control the water temp with, you can soak the clothes in cold water instead. You can use the soap that you ordinarily use if you wish, but I have found that some detergents work better than others. I started using this on my clothes because I have sensitive skin. Since it is made for sensitive skin, this also made it the perfect choice to use on my kids’ clothes, as well. It doesn’t have any other smells and leaves clothes smelling fresh. 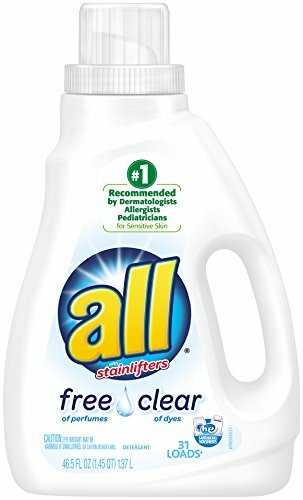 While a little on the expensive side, this detergent will do a good job at helping the baking soda to remove deeply set stains and smells. It is designed for cloth diapers, and I have always found it to keep them nice and clean. 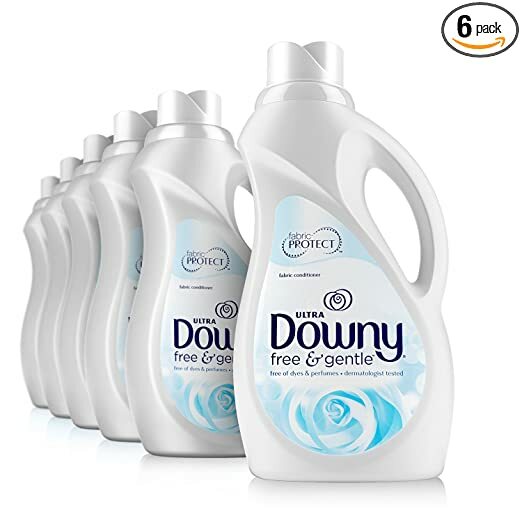 I like to use Downy Free and Gentle Fabric Softener. It helps to remove the smell and leaves clothes feeling ridiculously soft. Alternatively, you can utilize vinegar to get the same softness. However, you have to be careful not to use too much. Since it is just as (or more) acidic than the ammonia leftover in the clothes from the urine, this will put its particular smell in as well. Use whatever temperature for this period that you prefer. Drying the clothes with a dryer will leave them smelling fresh and feeling soft. If you want to save on electricity and the weather is beautiful, don’t hesitate to hang the clothes outside to dry. You’ll get the same fresh smell, but the clothes won’t feel as soft. Cold Water and Baking Soda – For the first wash cycle, you don’t want to add any of your normal detergents. All you’ll need for this first run through is a ½ cup of baking soda) put into your washer’s powder detergent tray. Then, simply run the wash through on a cold cycle just the same as if you had put in detergent. Cold Water and Borax – Alternatively, if you’d rather use borax, you can follow the same plan as with the baking soda, but you won’t need quite as much. 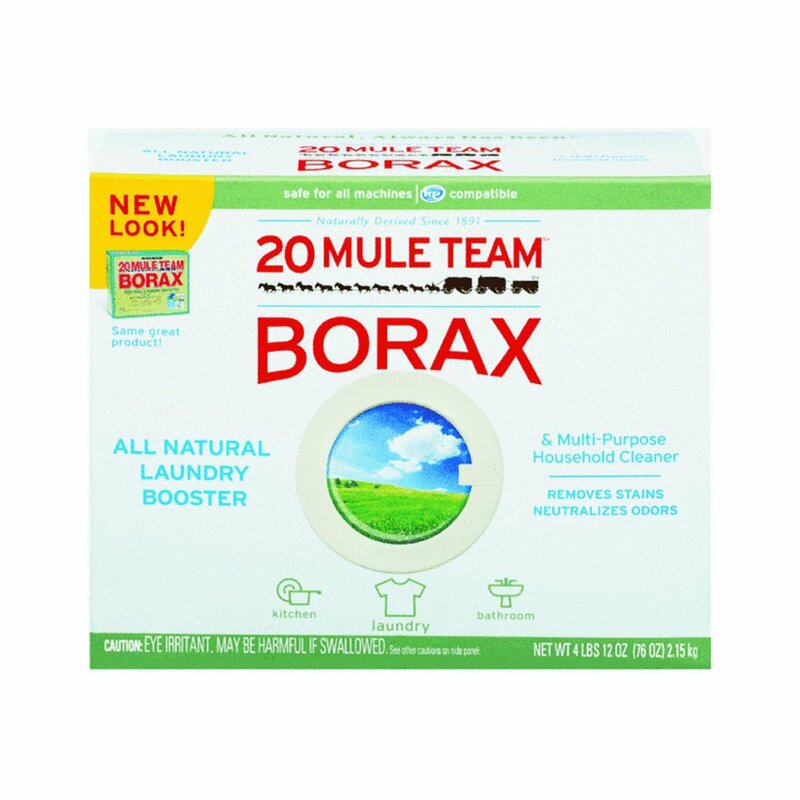 You will only need to use a ¼ of a cup of borax for this load of wash. Note:of all of the steps you need to follow, this is the most crucial, since you need to first neutralize the ammonia that is left over in the clothing after the urine has dried. If you don’t neutralize the ammonia, the smell will continue to persist. Regular Wash Cycle with Detergent and Fabric Softener – After you have gone through the cold cycle with the baking soda, it is time to put the load of clothes through the wash one more time. This time, you can use hot water if you wish, but make sure to add your choice of detergent and fabric softener. Now that the ammonia has been neutralized, any leftover residue from the baking soda needs to be removed. 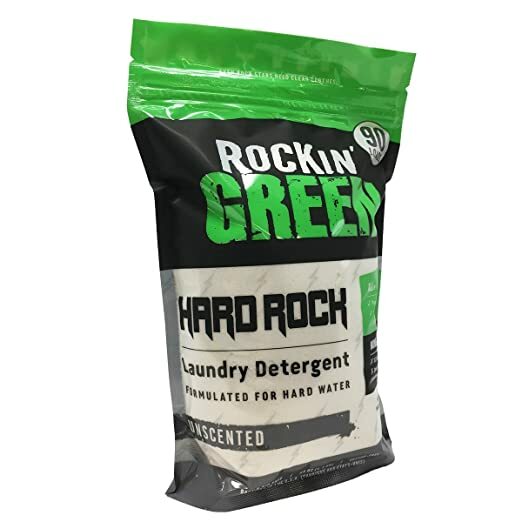 For persistent smells and stains, I highly recommend the Rockin’ Green brand of detergent. As I stated earlier, it’s designed to use on cloth diapers. This means that it is extremely gentle on fabric while also strong on getting out stains. Secondly, if it is intended for cloth diapers, it is supposed to remove smells from an item that is peed in ALL.THE.TIME! It is a bit more expensive, but it works! Once the clothes have been through the second washing cycle, you have two options for how you can dry them. Dryer – If you choose to use a dryer your clothing will come out smelling fresh and feeling incredibly soft to the touch. 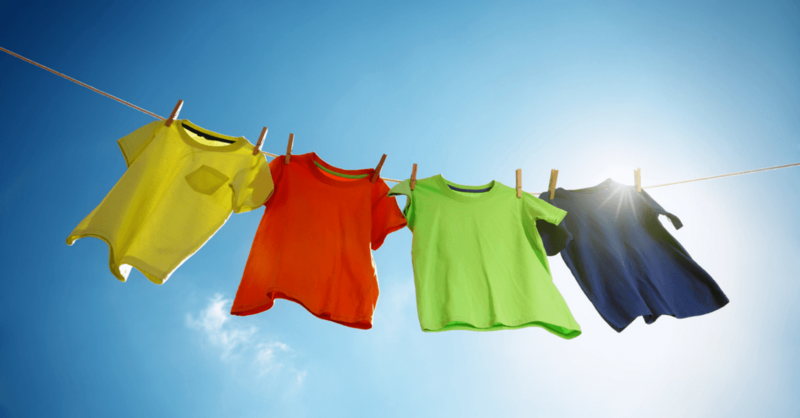 Hang Outside – Hanging clothes outside has a bunch of benefits that a dryer does not offer you. First of all, it’s free since it doesn’t take any electricity. Secondly, the clothes will smell fresh from being out in the breeze. Finally, the sun can help to remove some stains from clothing. The only drawback from this method is that the clothes might become a bit stiff. Now, Go Get Those Smells Out! Now you’re probably thinking to yourself, “Well, that’s so easy, I wish I’d have known that sooner“! I hope that my experimentations and urine smell removal knowledge have been of assistance to you. Hopefully, you can use this knowledge to keep your kids clothes smelling and looking great! If you liked the article, please feel free to share it, so your friends won’t have to deal with smelly kids clothes either! What methods have you used to remove urine smells from clothes? Did it work? Please let me know in the comments section.